LG Electronics Performance troffer t-bar lay-in fixture features frost polymethyl methacrylate optical unit that ensures even light distribution. 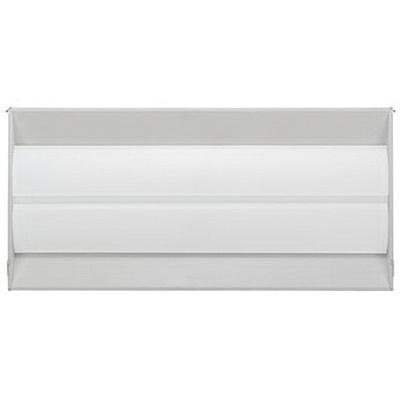 This fixture in rectangular shape, uses 26-Watt LED lamp that has voltage rating of 120 - 277-Volts. Lamp has color rendering index of 82 and color temperature rating of 4000K to ensure optimal light level in the surrounding. Lamp offers 3400-Lumens of bright light output. It features 0 - 10-Volt ZigBee-ready dimming control. Fixture measures 48-Inch x 24-Inch x 2.8-Inch. It comes with 50000 hours of average life. It has high system efficacy up to 133 LPW. Diffuser with large luminous area provides soft light and visual comfort. It has IP20 rated degree of protection. Fixture is cULus/UL listed and DLC certified.